MP3 Player built into a standard cassette casing, letting you either use it as a uniquely old school shaped MP3 Player, or with any car cassette or cassette player to play MP3 Music. You will have no problems listening to hours of your favorite songs as this product also has a built in SD Card Slot, saving you flash memory cost as well as letting you quickly change to different songs if you have different SD Cards. If you are into old fashioned retro looks, and new technology, this is a MP3 Player worth having and showing off! Purchase one of these no M.O.Q. 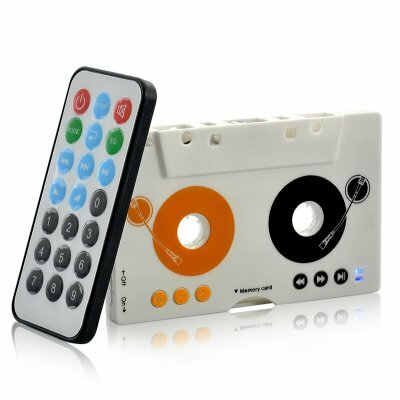 (no minimum order quantity) cassette MP3 players for yourself and be the first person on your block to own one of the coolest gadgets around. Then order more to resell on eBay or your own internet store to make some extra money to put in the bank. Brought to you by the leader in wholesale electronics, Chinavasion. Very good product! Pena not be available for purchase.